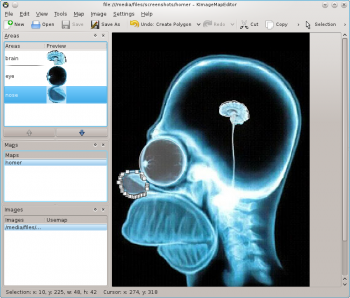 KImageMapEditor is an utility to create and modify HTML image maps. Ability to load and edit existing HTML image maps. Tools to create image maps: Circle, Rectangle, and Polygon. Ability to create image maps for user-defined image (JPEG, PNG, or GIF). The Handbook is available from here. This page was last modified on 31 August 2011, at 15:37. Content is available under Creative Commons License SA 4.0 unless otherwise noted.